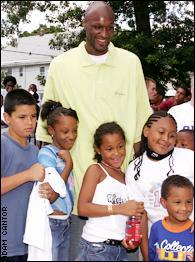 Odom with Cathy’s Kids participants in 2005. The first time I volunteered for God’s Love We Deliver, a charity devoted to feeding and delivering meals to infirm people, was in 2010. The company I was working for had charity retreats from time to time and I jumped on the bandwagon. However, I have to admit this go-round was just to get out of work early. Hey, I’m human (what’s that sound?…oh, my Halo hitting the ground.) So, anyway, I had very scant knowledge of the company. But a short orientation, tour of the kitchen and dozens of peeled potatoes later I fell in love with the place. And what my eyes lingered over most–other than the strong green onions that made them water–was the wall tiles that had signatures of stars like Joan Rivers, Heidi Klum and Tim Gunn. It’s common to have celebs participate in charity work, what was weird to me it wasn’t advertised, promoted or announced like their latest comedy tour or TV show release. Well, the mentoring part he got down. ESPN’s report shows that of the $2.2 million raised through Cathy’s Kids $1.3 million went to support two youth basketball teams. But…clinics for cancer is where he may have overstretched. Eight years worth of tax records show that not one red cent went to cancer related causes. The millions of dollars personally contributed by Lamar constituted more than 90% of the money raised by the foundation. All the funds donated by Lamar and the other contributions to Cathy’s Kids were used for one of the foundation’s intended charitable purposes. Not one penny went to help Lamar personally or any member of his family. Maybe not a family member. But a close friend. Jerry DeGregorio, who was Odom’s high school basketball coach and best man at his wedding to Khloe, was the only paid executive at the foundation. As secretary of Cathy’s Kids his yearly salary was $72,000. Not bad work if you can get it. Odom may be in the hot seat this week, but not to long ago–almost a year to be exact– we were wagging our fingers in MJB’s direction. The New York Post revealed the queen of hip hop soul’s charity, Foundation for the Advancement of Women Now (FAWN) meant to empower women and send them to college, was mishandling funds. Despite Mary J Blige touting fragrances and benefit concerts for the foundation, the donated money was nowhere to be found and failed to file tax returns. At the time Mary said she didn’t have the right people in the right places doing the right things. A problem most stars are faced with. However, what baffles me is why start a charity at all if you’re clueless about running it? In retrospect, I understand we all want to do our part to help others and as a celebrity it will be even more beneficial for those who are in need. But, run improperly, it’s not just those who are dependent on the charity that suffer, but also that star’s reputation. Ken Berger, president of Charity Navigator, a watchdog for non-profits, says celebrities have a bigger responsibility than ordinary people in getting it right. It’s critical that when these kind of opportunities are available that the celebrities involved realize the profound responsibility that they have to try to get as much money to support these worthy causes as they can and to make sure they don’t damage the public trust.